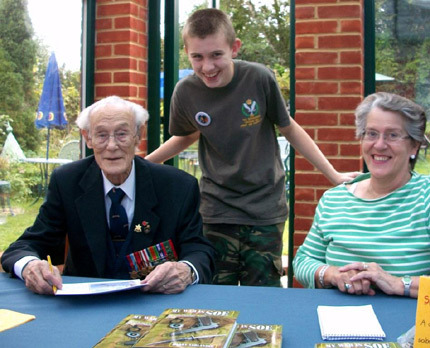 The Museum welcomed SOE veteran Harry Verlander and his dear wife Liz for another visit to Shoreham on the August Bank Holiday and as ever our amazing hero entertained visitors with his extraordinary tales of his behind enemy lines activities. Our young volunteer Aiden met Harry for the first time and now knows how to deal with a Japanese soldier swinging a Samurai sword in his face! 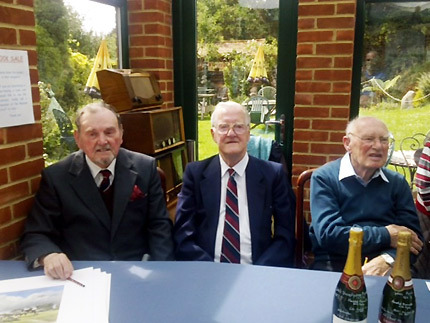 It was a rare and wonderful occasion to welcome three Hawker Typhoon veterans to the Museum on Sunday 17th July 2011. Sydney Pigden, Jack Hodges DFC and Ron Pottinger (L to R in picture) all had amazing tales to tell of their experiences flying the mighty RAF ground-attack fighter. They also did sterling work signing prints and books for Museum visitors and Geoff Nutkins classic Typhoon print “Double Trouble“, signed by all three guests is available to purchase. All proceeds from the sale of the print go to the Museum’s projects. Please contact the Museum for details. You are currently browsing the Shoreham Aircraft Museum – News archives for August, 2011.